In this year's annual event, Apple announced that the company had paid out $70 Billion to developers in the App Store's lifetime and that $21 Billion of the amount was paid in the last year alone. But has all this money gone to the legitimate app developers? Probably not, as app developer Johnny Lin last week analyzed the Apple's App Store and discovered that most of the trending apps on the app store are completely fake and are earning their makers hundreds of thousands of dollars through in-app purchases and subscriptions. Shady developers are abusing Apple's relatively new and immature App Store Search Ads, which was launched at last year's Worldwide Developers Conference (WWDC), to promote their app in the store by using a few strategically chosen search ads and a bit of SEO. "They're taking advantage of the fact that there's no filtering or approval process for ads, and that ads look almost indistinguishable from real results, and some ads take up the entire search result's first page," Lin wrote in his lengthy Medium post. "I dug deeper to find that unfortunately, these aren't isolated incidents, they're fairly common in the app store's top grossing lists. And this isn't just happening with security related keywords. It seems like scammers are bidding on many other keywords." 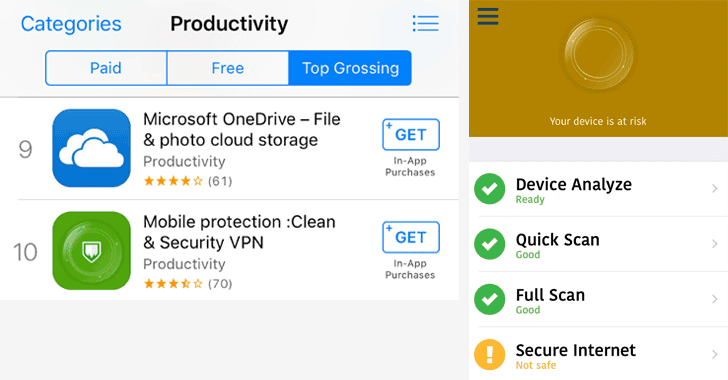 One of the top earning apps Lin found was named "Mobile Protection: Clean & Security VPN" that tricked users into signing up for a $99.99 per week subscription for a complete garbage service by just laying their thumb on the Touch ID. According to Lin, this app alone has earned its developer an estimated $80,000 per month, according to data from marketing firm Sensor Tower. With spell and grammatical errors and fake reviews, 'Mobile Protection: Clean & Security VPN' claimed to be a Virus scanner, prompting users to "Instantly use full of smart anti-virus" by offering them a "FREE TRIAL." 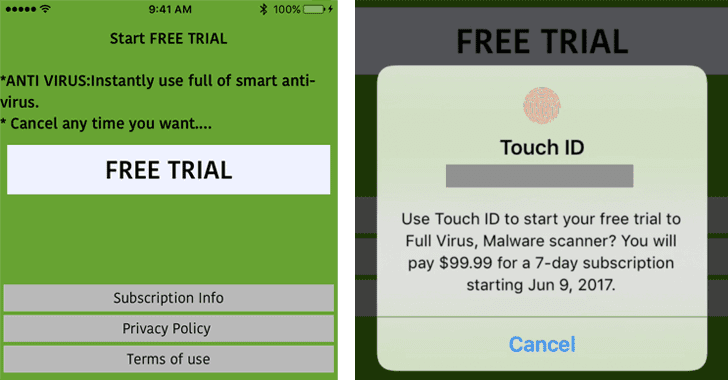 "Use Touch ID to start your free trial to Full Virus, Malware Scanner? You will pay $99.99 for a 7-day subscription starting June 9, 2017." Usually, users who landed on the Touch ID screen making their mind for a free trial accidentally pressed their thumb on the Touch ID, which netted nearly $400 per month from just one user. Therefore, the shady app developer needed just 200 people to be tricked into paying for the junk service to earn them $80,000 per month, which means $960,000 annually, according to Lin's calculations. Lin explained how shady developers are abusing the App Store Search Ads service and "taking advantage of the fact that there's no filtering or approval process for ads, and that ads look almost indistinguishable from real results." Though Apple removed the app, and several other apps that Lin highlighted in his post, but its App Store is still full of shady apps that use in-app purchases and misleading descriptions to trick users into spending lots of money on garbage. Open Settings app and go to iTunes & App Store → Apple ID → View Apple ID. Enter your Apple ID password or press against Touch ID when prompted. Click on Subscriptions and then tap on the subscriptions you want to cancel, and tap Confirm. Now once your current subscription period ends, you'll not charge. Lin has also provided a long list of recommendation for Apple to implement to make its App Store safe for users, which includes steps to make better UI on Touch ID subscriptions, stricter Review of subscriptions, easier cancellation of subscriptions, fraud- and abuse-proof Search Ads, and remove scams and refund users.